The mission of FreshTV is to encourage student growth and exploration in the area of cinema, journalism and broadcast production. We are searching for creative and ambitious individuals. 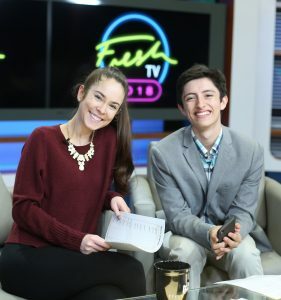 FreshTV is an accelerated training program that prepares students to be successful in the many areas of communications. The program consists of a series of workshops that are designed to set students up to have the base knowledge and contacts to be successful in the beginning of their college career. The program consists of 15 weeks of training that cover basic training on cameras and other equipment, studio rotations, non-fiction and fiction story design and production and planning. Students in Elon’s School of Communications are all encouraged to pursue a specialty, but they’re also required to demonstrate core competencies across media platforms. FreshTV introduces students to the worlds of news reporting, documentary filmmaking and non-fiction storytelling.